See images above. Make your winter strolls much warmer and more comfortable with the new AZBABY Stroller Hand Warmers. Its innovative design makes it easier for you tend to your little ones while outdoors. It measures 13" long and 8" wide which makes it ideal for everyone. Simply install it on the stroller handle and slide your hands in and out as needed. Fits on all single bar handle and double handle prams and jogger strollers. Jazz up your strollers and pram and be prepared for your next winter stroll. Get yours today! BEST COLD WEATHER SOLUTION. Keeping your fingers warm on the chilliest days while outdoors is best enjoyed with this stroller hand muff. It's simple to install and use making it easier to attend to your child's needs anytime, anywhere. DURABLE AND TOP QUALITY. Each piece is made from top-class materials to withstand the equally tough weather. It features a breathable, water resistant, and thick triple layer fleece to keep your hands warm and dry all throughout your stroll, making you feel like you've got your favorite gloves on. EASY ON AND OFF. Snap these warmers without any fuss onto your stroller handle to keep your hands warm, cozy and dry while out for a stroll. It easily attaches onto handles making it a breeze to slip your hands in and out when needed. SIMPLE INSTALLATION. 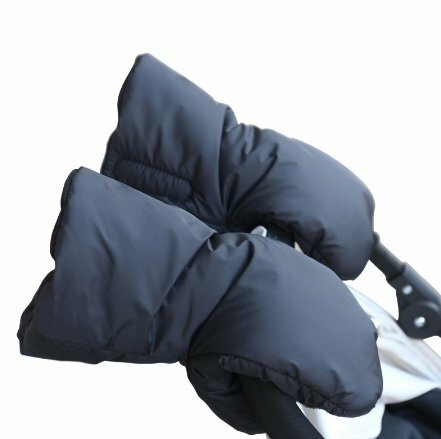 This smart winter accessory features Velcro fasteners for easy attachment on most kind of prams, strollers, shopping cart, and more. Its functional design ensures a secure clasp on the handlebar allowing convenient maneuverability on the go. 100% SATISFACTION GUARANTEE. Winter walks with your little ones have never been so comfortable and stylish! Love this or get a full purchase price refund only from AZBABY. Order yours now! View More In Weather Shields. If you have any questions about this product by AZBABY Stroller Hand Muff, contact us by completing and submitting the form below. If you are looking for a specif part number, please include it with your message.